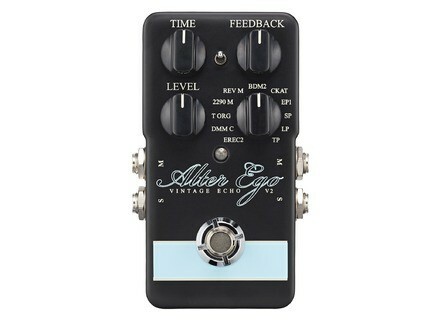 Alter Ego V2 Vintage Echo, Delay/Echo/Phrase Sampler for Guitar from TC Electronic in the TonePrint series. 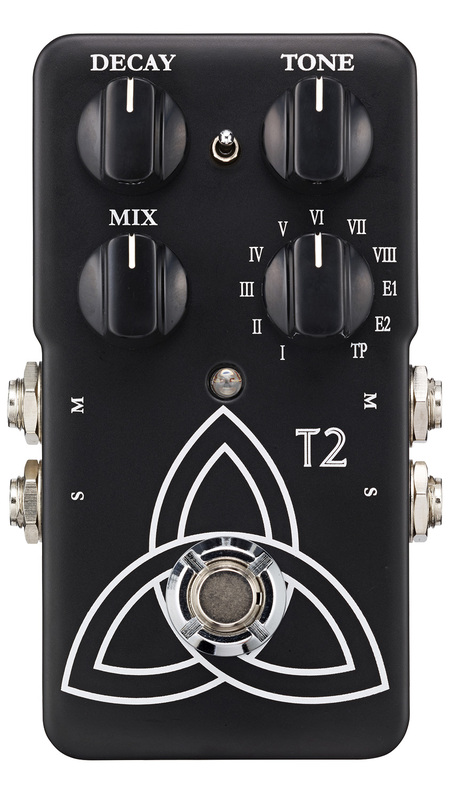 TC Electronic introduces new versions of its Alter Ego Vintage Echo and Trinity effect pedals, the latter has been renamed to T2 for the occasion. Both Alter Ego v2 and T2 have been designed by TC Electronic in collaboration with US ProGuitarShop. Though the T2 look is very similar to the original Trinity, the Alter Ego v2 dropped its golden finish for the more classic look of the x4 model launched earlier this year. Plus, both pedals feature a memory slot for one TonePrint preset for bass or guitar and are compatible with the freeTonePrint Editor software. The T2 offers 10 reverb sounds customized by ProGuitarShop, along with the TonePrint of your choice. The effects available range from the modulated plate from the 80s to an endless “space trip”. You can also adjust the tone, decay time and intensity of the effect thanks to three knobs, and a Pre-Delay mini-switch controls the duration between direct sound and the reverb coming in. 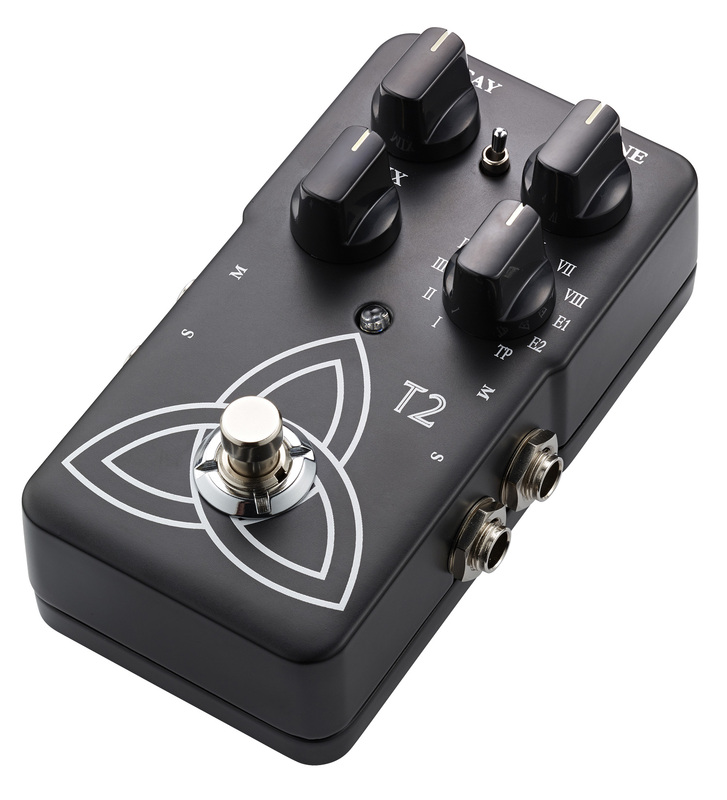 The T2 features stereo inputs and outputs, a Spillover option and your can choose between true and buffered bypass. The T2 will be in stores starting next week for the price of EU 149€. More info at tcelectronic.com/T2. The Alter Ego V2 Vintage Echo is a more compact and affordable version (169€) of the Alter Ego x4. It also features 10 reproductions of vintage echoes/delays designed by ProGuitarShop and TC Electronic. You’ll find the EchoPlex, Echorec, an exclusive modulated version of the TC 2290 and other classic effects, to which you’ll add your favorite TonePrint. You can control on the Alter Ego V2 the delay time (up to 7 seconds), effect level, feedback (number of repeats and amount of effect that is sent back to the input) and subdivision time (quarter notes, dotted eighths or a combination of both). An Audio Tapping feature and a 40-second looper are also on the menu, along with stereo inputs and outputs, a Spillover on/off and a choice of true or buffered bypass. 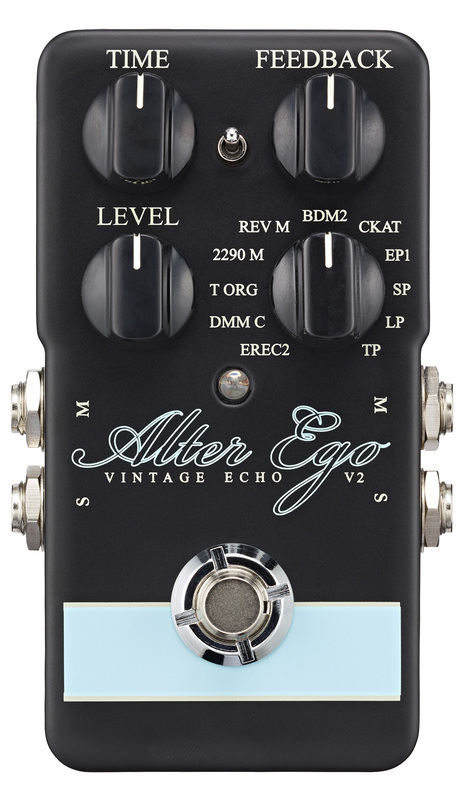 All the details about the Alter Ego v2 Vintage Echo are online at tcelectronic.com/alter-ego-2-vintage-echo. LTD new guitar and bass packs If after his first day at school your kid decided that he’d become a metal god this year, LTD can help him without bankrupting the whole family. The Dawner Prince Viberator is in stocks Croatian boutique manufacturer Dawner Prince Effects announces the availability of their Viberator vibrato and chorus effect for guitar. MOD launches its KickStarter campaign Brazilian MOD has just launched its crowdfunding campaign for their new MOD DUO multi-effect pedal.